This ALMA image of the week shows the binary star system of LL Pegasi and its companion. Although it looks like the pattern of a shell on the beach, this intriguing spiral is in fact astronomical in nature. The Atacama Large Millimeter/submillimeter Array (ALMA) captured this remarkable image of a binary star system, where two stars — LL Pegasi and its companion — are locked in a stellar waltz, orbiting around their common center of gravity. The old star LL Pegasi is continuously losing gaseous material as it evolves into a planetary nebula, and the distinct spiral shape is the imprint made by the stars orbiting in this gas. The spiral spans light-years and winds around with extraordinary regularity. Based on the expansion rate of the spiraling gas, astronomers estimate that a new “layer” appears every 800 years — approximately the same time it takes for the two stars to complete one orbit around each other. This image is a composite of images made with the NASA/ESA Hubble Space Telescope and the Atacama Large Millimeter/submillimeter Array (ALMA), both observing the binary star system LL Pegasi. The old star LL Pegasi is continuously losing gaseous material as it evolves into a planetary nebula, and the distinct spiral shape is the imprint made by the stars orbiting in this gas. LL Pegasi was first highlighted about 10 years ago when the NASA/ESA Hubble Space Telescope obtained a picture of the almost-perfect spiral structure. This was the first time a spiral pattern had been found in material surrounding an old star. Now, ALMA’s observations, of which this image only shows one “cross-section”, have added an extra dimension to reveal the exquisitely-ordered 3D geometry of the spiral pattern. A full view of the 3D video can be seen in this video. 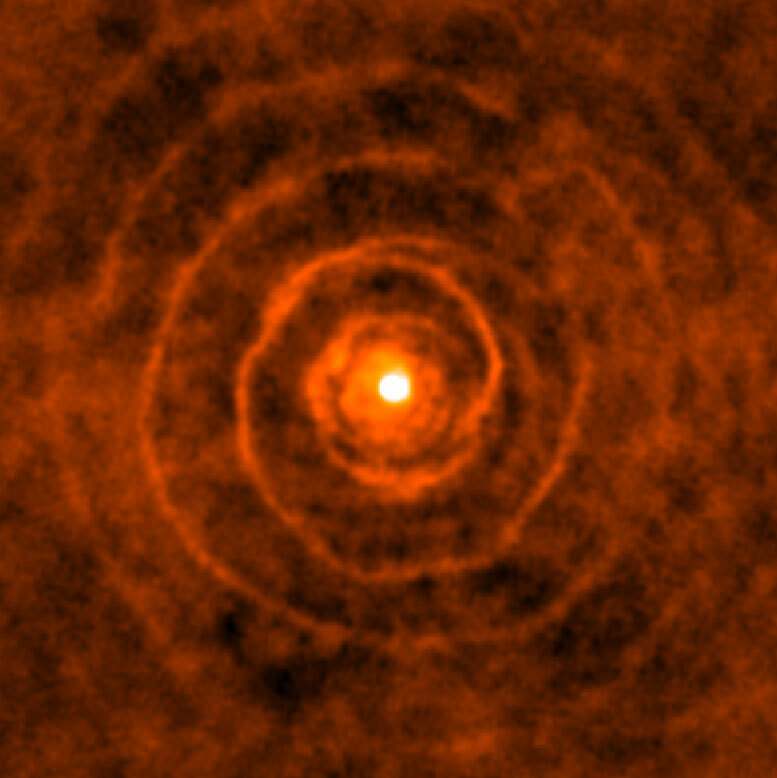 This video shows the observed structure surrounding the binary star system LL Pegasi, as seen by the Atacama Large Millimeter/submillimeter Array (ALMA). 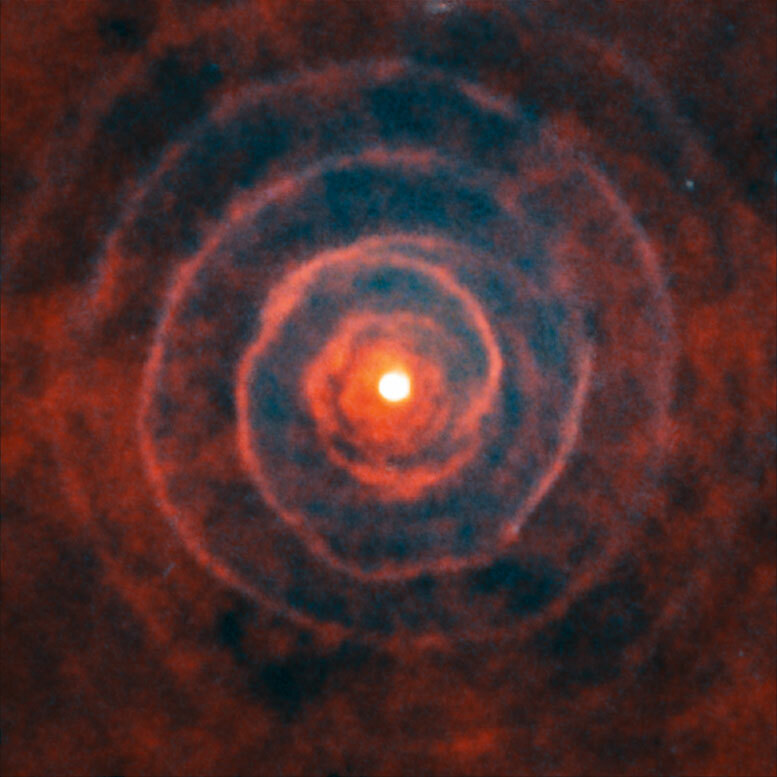 ALMA’s observations were able to reveal the exquisitely-ordered 3D geometry of the spiral pattern (seen to the left). The observations match almost perfectly with the predicted theoretical model (to the right). Credit: ALMA (ESO/NAOJ/NRAO)/H. Kim et al. 2 Comments on "New ALMA Image of LL Pegasi and Its Companion"
Most stars in this universe is binary and tertiary in formation. Even our own Solar system can be considered to be the result of tertiary stars or more in formation if we can conclude that our giants like Jupiter , Saturn and Uranus as failed stars. Thank You.